In considering the creation of poverty I have argued in previous posts that the narrative meaning we ascribe is vital. It is this story that underpins the lifestyle and the cultural exchange that pulls us towards the curated inequality that is increasingly at the heart of our society. I would argue also that one of the other key sustaining factors of this narrative is this; fear. This comes in many forms; fear of losing what we have, fear of some kind threat posed by the other (immigrants, the great unwashed, drug using outsiders etc.) and fear of a loss of security that might send us spiralling downwards from whatever security we have carved out for ourselves. The degree to which these two factors (Story and Fear) are deliberately employed by our ruling elite, or are emergent properties of a society sustained by the exultation of money and property is one of conjecture. There is clear evidence that current government policies are shaping this narrative towards vilification of the poor, framing poverty as primarily the result of poor choices, addictions and inadequate family structures. There appears to be a great reluctance to describe poverty in financial terms, or to acknowledge the role played by austerity and cuts to what had previously been regarded as essential services. This is not a new perspective on the poor however, rather one that has been given credence and confidence by circumstance. For some time, alongside the narrative that has centred around the unaffordability and immorality of welfare benefits in a time of austerity (bolstered by the dominance of an American right-wing consciousness very different from traditional Conservatism) there has also been an acknowledgement in parts of the press of the excesses of the super-rich; tax avoidance, hedonistic excess and the sexual peccadillos of members of the House of Lords always sells newspapers. Despite the clamour against the bankers and stock brokers that arguably drove our economy into the recession that we still labour beneath, on the whole, the super-rich have never had it so good. Their wealth is increasing and the gap between their way of life and the poorest sections of society is now akin to that of Edwardian Britain. What then of the rest of us? If (as I argued previously) poverty for some is the inevitable consequence of the wealth of others, what does this mean for those of us (like me) who have those badges of belonging to the comfortable class; mortgage, new-ish car, reasonable earing capacity and an accumulating pension pot? Do these things make us happy? Are they any guarantee of life satisfaction? Do they represent a sustainable way of life? Do they even represent a good life? Leaving aside any moral/theological answers to these questions (compelling though they may be) there are some clues from research. Some of this was gathered together by Kate Pickett and Richard Wilkinson in a book called The Spirit Level. In this book they try to grapple with what inequality does to us, on an individual and a societal level. These quotes are from here. The truth is that human beings have deep-seated psychological responses to inequality and social hierarchy. The tendency to equate outward wealth with inner worth means that inequality colours our social perceptions. It invokes feelings of superiority and inferiority, dominance and subordination – which affect the way we relate to and treat each other. 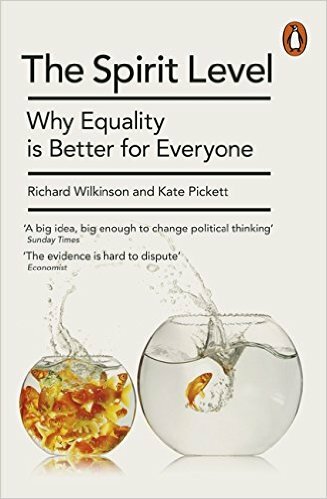 … Most important has been the rapid accumulation of evidence confirming the psychosocial processes through which inequality gets under the skin. When we were writing, evidence of causality often relied on psychological experiments that showed how extraordinarily sensitive people are to being looked down on and regarded as inferior. They demonstrated that social relationships, insecurities about social status and how others see us have powerful effects on stress, cognitive performance and the emotions. Almost absent were studies explicitly linking income inequality to these psychological states in whole societies. But new studies have now filled that gap. That inequality damages family life is shown by higher rates of child abuse, and increased status competition is likely to explain the higher rates of bullying confirmed in schools in more unequal countries. You can read more about the impact of inequality on social functioning here. These appear to be stable, well understood phenomena, acknowledged even by organisations such as the IMF (who seem paradoxically intent on fostering and promoting inequality despite this.) The more unequal a society is, the more we all suffer. Inequality is kind of social toxicity that makes us all sick. Why is this not political dynamite? Why are we not lining up to say that this is the greatest evil facing our society; the greatest threat to our so-called British way of life (rather than ramping up the fear factor and claiming these things for Islamic terrorism?